Our Kirkwall cruise port guide gives you information about the docking location, cruise dock, transportation options and much more! Welcome to the Kirkwall Cruise Port Guide. Kirkwall is a small town with about 9000 inhabitants. It is the administration centre of the Orkney islands. At first sight it might look like the town has little to offer, but this is to the contrary. This is a charming old town that is easy to explore by foot. Kirkwall is the heart of the Orkney islands just off the coast of Scotland. The Orkney islands are a unique archipelago that counts 70 islands. Only 30 of them are actually inhabited. All together there are about 20.000 people that live on the Orkney islands. The vikings already left their language, buildings and genes on the island, but its history goes further back than that. They say the Orkney islands contain the densest concentration of archeological sites in Great Britain. These islands have been inhabited for thousands of years. The neolithic people started to leave their traces about 5000 years ago. Of all the archeological sites the 4 most well known are commonly referred to as the “Neolithic heart of Orkney”. They are listed on the UNESCO world heritage list because of their extreme beauty and educational value. 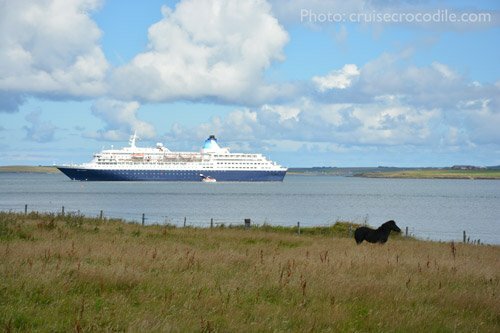 ‘ The archeological sites, distillery, castles and old town is what makes Kirkwall a great cruise destination. Find out where your ship will dock or drop anchor underneath and what there is to see and do on the island. This is the Hatson Pier in Kirkwall. If your ship will dock this will be your view from the ship. As you can see it is quite an industrial area. If your ship will tender you ashore it will drop anchor in the middle of the bay. If you are tendered to shore this is where you will be dropped off. This small tender pier is right in the centre of Kirkwall. This Hatston dock is about 2,5 km / 1,5 mile from the city centre. In most cases the port will provide a shuttle service into town. 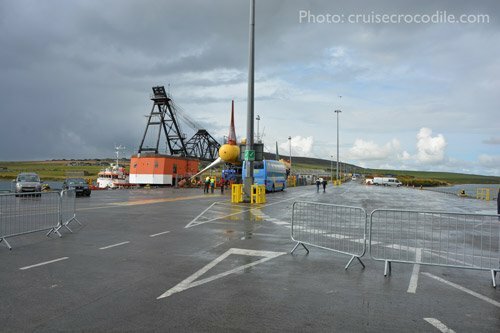 This information will also be available on: http://www.orkneyharbours.com. These busses are wheelchair accessible. They often go to the tourist information centre in town. At the dock you will find a representative of the tourist information and taxis. If your ship is planned to drop anchor in the bay and tender you to shore with the lifeboats you will arrive right in the centre of town. At the tender pier you will find a representative of the tourist information, taxis and public transportation close by. Their is a tourist information centre in town that offers excellent facilities. They have souvenirs, brochures and lots of information on transportation options. See the map above for the exact location of the visitors centre. The city bus T11 is a great bus service to visit some of the sites out of town. 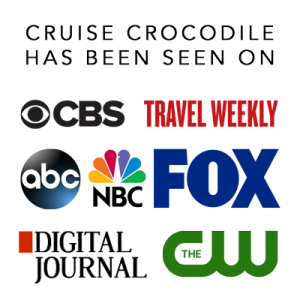 There are only 1 or 2 departures a day and therefore with a cruise ship in town it can be quite crowded. Keep in mind: first come, first serve. Pay 8 pound to the driver. The bus leaves at the tourist information centre in town at about 10 am and 2 pm. The total round takes about 3,5 hours. 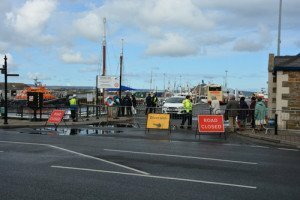 There is a limited amount of taxis available at the pier in Kirkwall. Negotiate a price before you get in. Expect you will pay approximately 35 pound per hour to hire a taxi. Exploring Orkney by car is an excellent way. Therefore renting a car is not a bad idea at all. There are however a very limited amount of cars for rent in Kirkwall. Therefore we highly recommend to book a car sooner rather than later. Try JD Peace and Co or WR Tullock and Sons. There is wi-fi available at the Kirkwall hotel and other restaurants/cafes in town. The best place to go for souvenirs and shopping would be Albert Str. Find your yarn, handicrafts and lovely boutiques here. 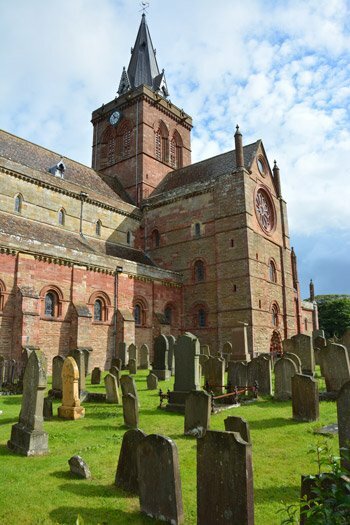 The eye-catcher of the town of Kirkwall would be the St. Magnus Cathedral. It is constructed in 1137 and is still in use today. There is something very mysterious about this cathedral. The sad look, combined with the old graveyard and unusual stones make a unique church. Find it in the middle of town. One of the most famous archeological sites is the Ring of Brodgar. It is one of the oldest and largest stone henge moment found on the British Isles. 27 stones of 60 stones still stand here today. 60 stones at a 6 degree angle make up a perfect 360 degree circle. It must have been a huge engineering project during those days. There must have been a large community that had put this together for one common purpose. The Ring of Brodgar lies 11,5 mile west of the port. Across the St. Magnus Cathedral you will find some medieval structures in ruines. The Kirkwall castle, Bishop’s palace and Earl’s palace stand side by side. 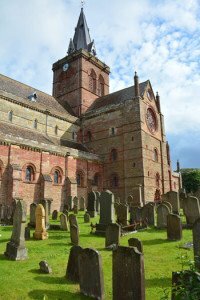 It is a great location to learn more about historic Kirkwall. This archeological site is where you find 4 standing stones. Originally it would have been 12 stones. They believe this to be the oldest of the henge monuments, although the site was never finished. This site lies 10,5 mile west of the port. This is the best location to get an amazing impression on life in the Neolithic period. In 1850 a storm hit the Orkney Islands and uncovered a neolithic village. Archeologists were able to put together the puzzle pieces of how these people used to live: their farmings methods, their engineering techniques and living habits. There are 7 different houses. All are connected to each other and they are even fairly comfortable if you have a close look. It gives a fascinating and tangible inside look to what the stone age was all about. Skara Brae lies 17 mile west of the port. This is the main shopping street in the town of Kirkwall. 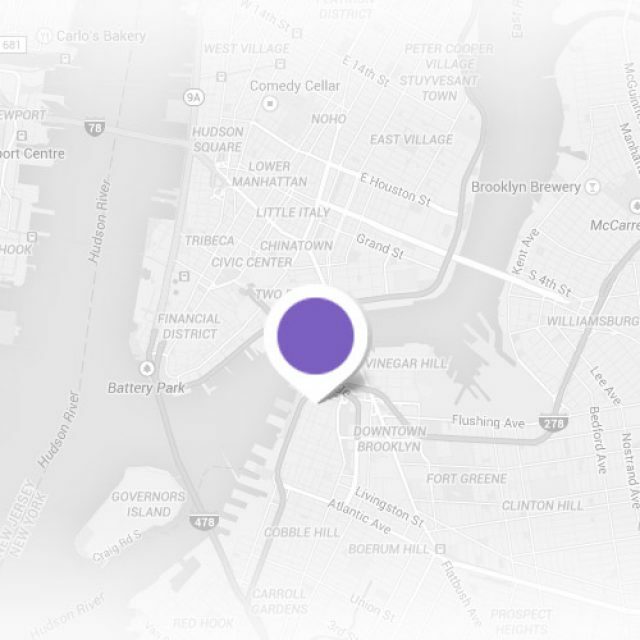 Find all kind of lovely boutiques and local stores here. In the south you will find the Churchill Barriers. They are great causeways built by Italian prisoners of war during World War II as anti-submarine barriers. The bay was the main base of the Royal Navy during WWI and WWII. Go with a guide to get the picture behind the operations that took place here. Scala flow lies 16 mile south of the port. The ride includes a crossing on ferry.